OK, I’m going to bring up a controversial subject here on SLS. Let me lead into it gently. I realize that most humans have a very difficult time accepting the possibility that there is no purpose in life. I’m not one of them. I believe that we are simply very lucky to be alive for an all too brief span of time here on Earth and everyone should work to optimize their experience as much as possible. If you think about it, each of us alive right now is a “successful organism” in the sense that each of us can trace a biological lineage to the beginning of human kind. That’s a pretty amazing concept and all the more reason why we should work to protect our ancestor’s investment in our lives. Generations upon generations have given their all to bring us life. The immensity of all this is why every time I hear about an indiscriminant murder I think about the impact on the biological timeline. Terminating someone’s life, in one fleeting moment, serves to halt that organism’s genetic journey throughout human history. The magnitude of the act is enormous. But I digress. Let’s get back to my original point. I actually feel empowered by my belief that there is no fundamental "purpose" in life, but rather the point is what each of us make of it. Imagine how fortunate I am, through an incredibly complex sequence of random evolutionary events, to be alive right now, especially as mankind awakens scientifically to be ever more aware of the workings of nature and the universe in which we live. I feel comfort in knowing that the basic elements needed to create life are formed in the heart of stars. When stars explode, these fundamental elements are scattered throughout the universe, seeding distant nebula clouds which give birth to new planets and new life. 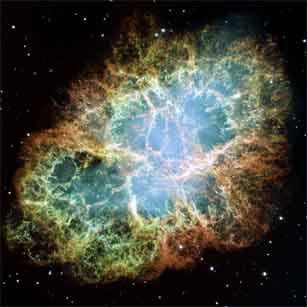 The hemoglobin in our blood – the elements oxygen and iron were created in a supernova. The gold in a wedding ring was created in a supernova. The calcium in our bones was created in a supernova. The molecules that make up our bodies. The atoms that make up the molecules. Are traceable to the crucibles that were once the centers of high mass stars. That exploded their chemically enriched guts into the galaxy. Enriching pristine gas clouds with the chemistry of life. to Earth chemically, and to the rest of the universe atomically. This makes me smile, and I feel quite large! It’s not that we’re better than the universe; we are part of the universe. We are in the universe, and the universe is in us. Dear Daniel, I think the same as you. But I think it isnt a popular pov thse days due to religiosity around the globe. I was a Methodist for years before I latched onto science and that chnaged my views on most things. I liked your poetry. "Recognize that the very molecules that make up your body, the atoms that construct the molecules, are traceable to the crucibles that were once the centers of high mass stars that exploded their chemically rich guts into the galaxy, enriching pristine gas clouds with the chemistry of life. So that we are all connected to each other biologically, to the earth chemically and to the rest of the universe atomically. That’s kinda cool! That makes me smile and I actually feel quite large at the end of that. It’s not that we are better than the universe, we are part of the universe. We are in the universe and the universe is in us." I thought I did give Dr. Tyson credit. If you read the blog post again I say "I found some prose from Neil deGrasse Tyson to reflect on this point of view". He did not call it a poem, I called it a poem and gave it the name "My Religion". Thank you for your comments.